Our Standard Handrails provide an excellent grip as a corridor handrail while still providing s great solution for wall protection. They come in 4 different styles/designs for maximum protection and are installed using aluminum retainers. Quick ship available for Straight Edge and Round Rail Handrail in these colors only: ivory, tan, champagne, eggshell, silver gray, teal, linen white, and windsor blue. All other styles and colors may be 4-week lead time. I want to get the 5 7 foot carnival piece. Do I need to get the right and left returns? What I want the 5 foot for the left side of hallway and 7 foot for right side. Does that mean I need 4 returns? The studs are every 16 inches, so I need brackets too? Help with knowing what returns are will help. Is there an email where I can send a picture of an end cap I am trying to find? Are these rails meant to be used outdoors (going up steps)? Also, is plastic like a composite or fiberglass product? 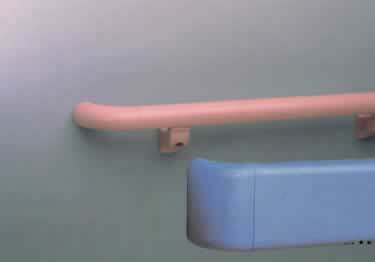 Love the vinyl covered aluminum handrail with the great color selections. It is fantastic looking in my stairwell.